A new analysis from Trulia, soon to be taken over by Zillow (maybe), claims the home price rebound is over. In other words, home price gains resulting from the prior crisis are kind of baked in at this point. And more importantly, you need jobs for your city to continue to see home price gains going forward. This is an important detail if you’re still looking to buy a home. Instead of bottom fishing, you’ve got to look at the future potential of the city or metro’s economic situation. If home prices simply rebounded because they overcorrected, there might not be much home price appreciation left. Conversely, if the city is bringing in new residents because of solid job growth, home price gains might still be in the early innings. And you might make a buck. Last month, asking prices nationwide increased just 0.5% from December, which is the smallest seasonally adjusted monthly gain since August. And year-over-year asking prices only climbed 7.5%, compared to the 9.3% year-over-year increase seen through January 2014. The good news is that asking prices continue to rise pretty much everywhere with year-over-year gains seen in 94 of the 100 largest U.S. metros in January. Jobs are always good for the economy and that generally translates to higher home prices in a given area. After all, the more people there are with money from a steady job, the more demand there is for housing and household creation. Even during the early years of the recovery, it was metros with strong job growth that saw home prices rise faster. But now it appears as if the correlation between peak-to-trough home price declines and subsequent home prices gains is statistically insignificant. That trend seemed to peak in mid-2013, and now fundamental things like job growth are primary drivers again. This is evidenced by recent year-over-year home price gains in places that didn’t experience a major housing bust. If you look at the top 10 asking price gainers above, you’ll notice that four barely experienced a home price crisis. Property values in Houston, Indy, Denver, and Austin didn’t even register 10% peak-to-trough declines during the bust. 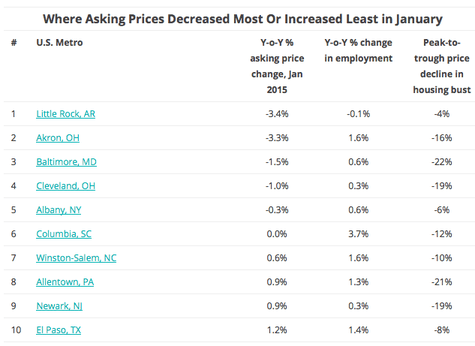 Despite this, year-over-year prices were up by double-digits in all these metros. They also happen to be exhibiting solid job growth. The only exception was Detroit, which is probably still enjoying a rebound effect to some degree. 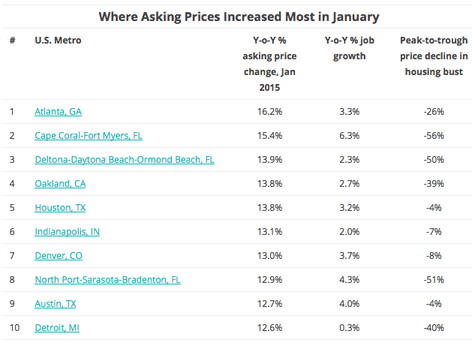 Now take a look at the bottom 10 metros in terms of asking price gains (or even declines). The biggest loser was Little Rock, Arkansas, where job growth was actually slightly negative over the past 12 months. All 10 metros have had pretty anemic job growth with the exception of Columbia, South Carolina, and all 10 have experienced weak year-over-year asking price gains (if any at all). Trulia also found that job growth matters when it comes to rent. Nationwide, rents increased 6.5% since January 2014. Rents increased the most in Denver, Oakland, San Francisco, St. Louis, and Phoenix. All five metros have experienced very positive job growth, though St. Louis only mustered a 1.4% gain. Still, it illustrates the back-to-basics trends emerging in the housing market. Long story short, you might want to check your city’s employment situation before house hunting.